Tonight, Google launched its Google Apps Marketplace, an online storefront for Apps products and services. Here are our notes from the announcement. And of course, the marketplace is launching with a number of pilot partners (50 to be exact). One of those partners happens to be recently launched Socialwok, a product that ads a social layer to Gmail and other Google products. At last year’s TechCrunch50 conference, Socialwok made a big splash, winning the award for best demopit startup and launching its enterprise-friendly, FriendFeed-like layer for Google Apps. The web-based application was praised for launching a social network that wrapped around the very unsocial Google Apps. And the startup just launched a gadget to allow users access all the features of Socialwok without leaving Gmail. 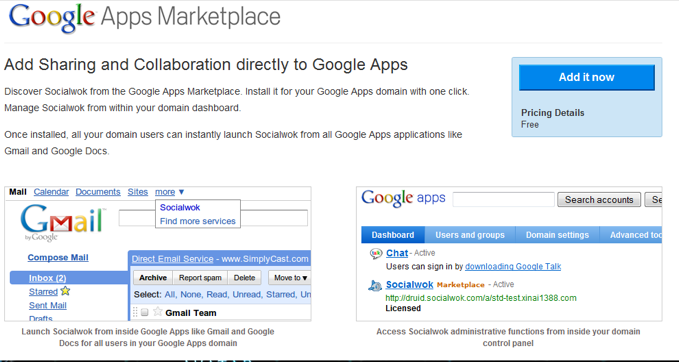 Socialwok in the the Google Apps Marketplace allows organizations to use their existing Google Apps accounts to login into Socialwok and create a social network for their domains to share within Google Docs, Google Calendars, Google Spreadsheets and other Google objects in feeds. For example, with the Socialwok Gmail gadget, users can view, post and comment on various feeds in their organization right from Gmail. Ming Yong, CEO of the company, said that integration with the marketplace was a logical choice because of the growing number of SMBs that are using Google Apps as their productivity suite of choice. Currently Google has more than 2 million businesses using the Google Apps Suite. Over 6,000 domains and tens of thousands of users are using Socialwok. Socialwok’s standard edition on the marketplace will be free but the startup will launch a paid edition in May. Socialwok, which employs a freemium model, has steadily been adding features and improvements to its application, including releasing a new version of its HTML 5 mobile version for Android and iPhone browsers. And in the process of developing an innocative application, startup managed to catch Google’s eye. Socialwok was chosen as one of the showcase companies for AppEngine technology at this year’s Google IO Developer Sandbox (Socialwok is powered by Google App Engine). And the startup wrote a blog post on Google’s Enterprise Blog about Socialwok. We’ve continuously written that if Google doesn’t buy the startup, they should at least heavily promoting what they’re doing. And it appears that Google has taken the latter route. For now. There’s no doubt that Socialwok could face the same fate as Google Docs killer and collaboration platform Etherpad or Microsoft Word collaboration plug-in Docverse.